It’s a very big weekend for everyone here at Anime Limited. As we post this not only are things underway in East London at the MCM London Comic Con where we’re exhibiting, presenting panels and getting to speak to the fans directly. We also have some big announcements across the weekend to share with you! We’re kicking things off things in a big way with the announcement that we will be releasing the hit series Sword Art Online II in the UK on both Blu-ray and DVD. The series will be coming to the UK in 4 parts (total) – in Collector’s Edition Blu-ray/DVD combi and Standard Edition DVD formats with Part 1 of 4 tentatively set for release August 2015. We’ll have more details on content info and release information for the other parts at a later date. Part 1 will contain episodes 1-7 of the “Phantom Bullet” arc of the series. The Collector’s Edition version will come packed in a rigid box, a digipack to hold the discs, a booklet containing information about the series as well as behind the scenes details and features exclusive to our release. In addition to this we can also confirm we intend to create a UK Exclusive storage box to house all four parts of the Collector’s Edition versions and this will be included with Part 1. We’ll have more details on this storage box, content to be included and release information for the other parts at a later date. 1 year after the SAO incident, Kirito is approached by Seijirou Kikuoka from Japan’s Ministry of Internal Affairs and Communications Department “VR Division” with a rather peculiar request. 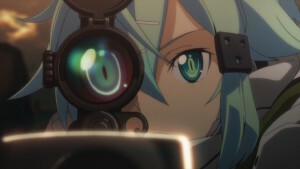 That was an investigation on the “Death Gun” incident that occurred in the gun and steel filled VRMMO called Gun Gale Online (GGO). “Players who are shot by a mysterious avatar with a jet black gun lose their lives even in the real world…” Failing to turn down Kikuoka’s bizarre request, Kirito logs in to GGO even though he is not completely convinced that the virtual world could physically affect the real world. As mentioned we’ll be sharing more details on our release of the series soon. Be sure to keep checking back throughout the weekend as we have more exciting news to share with you. Im bit surpised to be honest that you guys got SAO 2 sinds Mangauk previously released them. However great pick! day1buy for sure! Thankyou for picking this up, I loved your boxset efforts with Kill la Kill and such and think you were the best people to get it. Will be pre ordering as soon as it appears on Amazon UK. You are pretty much the only company in the UK that does awesome boxsets.